I get to answer this question all the time. 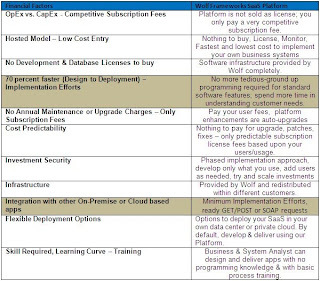 Let me share a quick overview for our partners and customers on how they benefit using Wolf SaaS Application Platform. And why does the world want to create Software-as-a-Service (SaaS) type Business Applications? I will skip this obvious explaination for today. 2. What typically will take months can now be achieved within weeks with additonal customization . 3. What used to be very technical – is made lot simpler with Wolf. It’s no more about code; it’s about point and click configurations and a great design. No DEVELOPMENT required! 4. We help you to innovate without worrying about existing infrastructures and manage your business needs & changes more efficiently. 5. With zero annual maintenance fees, we deliver new cool features and tools to make your life a lot easier. 6. 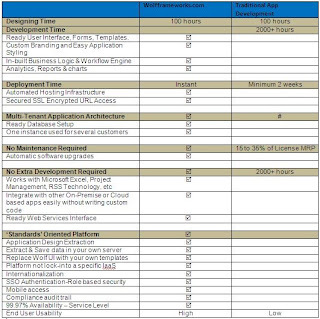 We help to dramatically lower your TCO (Software Licensing, Hardware, Bandwidth, Development Time, Deployment, Access & Maintenance) and reduce your risk on investments. 7. We provide 24/7/365 service availability with high SLA's so that you can scale your business and even get hands-on assistance from our Partner community to design your business solutions rapidly. Our motivation behind giving a totality to the Platform is targeted towards making life a lot easier for our partners to service their customers within limited budgets and time. In delivering these functionalities, we did not take the easier route, which was? Tie all of the elements: the user interface, business rules, database, hosting and the API’s together – we kept them quiet separate and as loosely bound as we can. I am happy to share more in my next post and hope this one provides a outline on how you can benefit using Wolf. Until then, don't forget to register & give us a try for your next SaaS Application requirement. NOTE: The views expressed above are purely personal and for informational purposes only. WOLF FRAMEWORKS INDIA PVT. LTD MAKES NO WARRANTIES, EXPRESS OR IMPLIED, IN THIS SUMMARY. The names of actual companies and products mentioned herein may be the trademarks of their respective owners.